This summer we will celebrate the very first art show at our own venue since we moved last year into our Museum Row location. For many years, the Japan Foundation Headquarters in Tokyo has been pre-curating several art exhibitions selected from our own collection and sending about twenty different sets per year to cultural institutions around the world, with lineups varying from traditional crafts to contemporary highly stylized media. 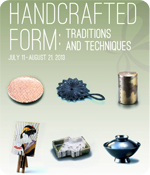 We are now very fortunate to have our Museum Row neighbor the wonderful Craft and Folk Art Museum collaborating with us to host one of these exhibitions, entitled Handcrafted Form: Traditions and Techniques. We are planning to make this exhibition into an enjoyable event for the whole community, so I hope you will be able to join us. Also, our closest neighbor across Wilshire Courtyard, the Goethe-Institut, will graciously let us use their Auditorium for our JFLA Lecture Series 10, Future Beauty: 30 Years of Japanese Fashion with Akiko Fukai. She is a world-renowned expert on Japanese contemporary fashion in the global context of modern history. Dr. Sharon Takeda from the Los Angeles County Museum of Art (LACMA) will be our moderator for this event. We are so fortunate to be surrounded by these wonderful cultural institutions and friends. I hope that you may also benefit from these wonderful opportunities on your next visit to JFLA! The universality and global characteristics of Japanese art that so pique the interest of the Western art world are not all to be found in mere Japonism. Join us in experiencing the earth-shaking madness brought forth by the artists of 1960s Tokyo. Issey Miyake, Rei Kawakubo, and Yohji Yamamoto showed their collections in Paris for the first time more than thirty years ago, roiling up both criticism and praise for their radical departure from Western conventions of fashion design. Akiko Fukai will delve into the soul of Japanese contemporary fashion and its vast and enduring impact around the world. Handcrafted Form introduces contemporary examples of traditional arts and crafts that have developed within the context of daily life, including ceramics, textiles, metalwork, lacquerware, woodcraft, papermaking, and writing implements. Through this exhibition, master artists and craftspeople display the depth of their creativity and the richness of their traditions, honed in regional workshops rooted deeply in the climate and landscape of regions all across Japan. We are now offering a free School Program designed to give students a fun and informative introduction to Japanese culture and traditions. It is approximately 90 minutes long and is available Tuesdays, Thursdays, or Fridays between 10 a.m. and 4 p.m.
We are excited to announce the participants for the 2013 JET Memorial Invitation Program. This program was started in 2011 to commemorate the work of two JET participants, Taylor Anderson and Montgomery Dickson, who sadly lost their lives in the Great East Japan Earthquake and Tsunami on March 11, 2011. 32 high school Japanese language learners from all across the United States have been invited for a 2 week study tour of Japan in July with a focus on the Tohoku region. We congratulate them on this achievement and look forward to meeting them in Los Angeles next month for the pre-departure orientation. Starting in June, JAPANEMA film screenings will be on hiatus through the summer as we will be hosting a special exhibition in our auditorium during that time. We will resume our evening film screenings in the fall, so please check back then for more information. Led by professional sushi chef Andy Matsuda of the Sushi Chef Institute, this course is designed for children 8 and up with accompanying adult. The entire menu is fun and easy for children to make at home with family. No prior Japanese language experience necessary. We provide an exciting opportunity for teenagers to interact directly with native speakers, on location in Little Tokyo, Los Angeles. Designed for 14-18 year-olds with no prior Japanese language experience, this course offers a great start for those planning to study Japanese. Registration for the 2013 Japanese Language Proficiency Test will be open from Monday, August 26th through Friday, September 27th, 2013, with the test date on Sunday, December 1st, 2013. Starting this year, the American Association of Teachers of Japanese will be in charge of all test administration roles. For more information, please visit their website below. In mid-February, we started accepting applications for several grant programs that we organize annually in support of Japanese language Education in the United States. The remaining grants include the Japanese Language Contest Grant (2nd Deadline: 9/3/2013), Japanese Teaching Materials Purchase Grant (2nd Deadline: 9/16/2013) and Japanese language Education Grant (Deadline: 2 months prior to project start date). The Kids Corner was created in our Information Center to accommodate younger visitors to our Library. We have a collection of children's books, manga, and games as well as kid-sized furniture. Please come and visit us! JFLA will be participating in this year's L.A. Tanabata Festival. Come to JFLA on Saturday June 8th to learn how to make paper flowers for Tanabata Kazari (decorations) and be a part of this summer tradition in Little Tokyo. The L.A. Tanabata Festival is a unique and colorful part of the Nisei Week Festivities in Little Tokyo. Back in April, we screened this film at JFLA as part of the Hapa Japan conference 2013. The producers premiered this moving on Link TV and KCET on May 22nd, and it is now available online through June 30th. Please click on the link below to visit their website and see how you can make a difference in someone else's life.